I’ve seen a couple of articles floating around the internet about homework over the last few weeks. This is not totally surprising — it’s testing season, we’re approaching graduation season, Spring Break is happening, the school year has reached that “we’re in the flow, but it’s turning into a bit of a grind” part of the year, and EVERYONE has an opinion on homework (including me). Mostly I think it’s important to talk about homework. I think we should talk about what it’s for, how it’s used, and how it can be better. I shared this article from Salon on my personal Facebook page. So far, we don’t do homework in my house. Admittedly, my daughter is in kindergarten, so it’s not a big deal and she doesn’t get graded for it. But kindergarteners (and to be totally honest all the kids) sit in chairs all day at school, and it’s hard for them. I really think that after school kids need to be playing, running, developing their other interests, and playing with their friends. Yes, we read. And sometimes we use the homework sheet as a place to get ideas (there was this really fun game with coins and counting a few weeks ago that we played for days). But I’m not going to fight with my daughter about it. I’m going to hold the line about important things like not hurting her sister and brushing her teeth, but I’m not going to use my energy to fight over something that probably isn’t going to make school better for her. Also, as a workaholic myself, I really don’t want this for my kids. I want them to know that they can take days off, they don’t have to feel like they need to constantly contribute to work, and that there are times that are just off. It’s really important to me that my daughters know that “we don’t have to work all the time.” I want them to know that we can take days off, that there is time enough for all the things, and that I firmly believe that they will be better able to do their best work at school if they don’t do a whole bunch of school work at home, too. Then, because easy answers aren’t all that easy, the universe (via Anne Helen Petersen’s weekly newsletter) send me this article, which paints a very different picture of homework. Pinsker points to research that it’s not any specific amount of homework that’s good or bad, but the type that we should be more flexible and creative with. He cites teachers that assign work and give students flexibility of when they do it, allowing them to develop time management skills. Another teacher provides optional extra worksheets for students who would like to do it. Another group of students used their after school time to build a trebuchet. These all sound like enriching ways to use homework as an opportunity to deepen and expand learning. I think those are very good points, and in a totally different universe from me arguing with my six-year old about whether or not we’re going to practice sight words after school. I think a lot about what I want for my daughters’ (and all their classmates’) education: I desperately want them to love learning, to know themselves, and to be whole people. And learning at home can be a part of that. When I graduated from college, I imagined myself as a disembodied head — totally out of balance because my brain was full of knowledge, but my body was out of shape and neglected. I’d only been feeding my mind for (honestly) the past 12 years of so. I feel like a big reason that I was drawn to taekwondo training and felt motivated to open a Martial Arts Studio with my husband was because I felt like I needed to put myself back together again. I didn’t really want a desk job where I could continue to ignore my body for another 40 years while I climbed the corporate ladder. This is a point that I feel is really missing from both of these (really well done) essays about homework. We measure whether or not the homework is working based on student test scores and graduation rates…but we don’t track things like “student happiness” or “mental well-being.” Those are important factors in a child’s education, and I think we should focus more on those things. It reminds me of a Freakanomics podcast I listened to about six months ago called “How to be Happy” in it host Stephen Dubner explores the United Nations World Happiness Report and the characteristics of happy societies, and how we can focus more on well-being than economic growth or low unemployment. It also reminds me of Anne Helen Petersen’s wonderful article about Millennial Burnout. Part of the reasons millennials (as a group) feel burned out is that we kind of prioritized school, studying, and achievement to the detriment of everything else. This is definitely something that I think “I could be totally wrong about this.” But like I said, everyone has an opinion about homework, and my opinion is: when we think about homework and our kids, we shouldn’t just be thinking about next week’s spelling test, the end of year test, or the SATs. We should think about the relationship with work that we want our kids to have, and we should know that we need to show them how to be whole people…not just educated kids. There are several points that can be made here, and I certainly won’t have all of them on the top of my memory, but I also think it’s important for others to share, opening up a dialogue. Growing up, I didn’t care much for homework, and only in middle school did I pursue academic excellence, organizing and setting the first hour, when I got home, to complete my homework. I figured, if I sat and worked for an hour, that was enough, but I would sometimes get to school early and complete any unfinished work. I’m glad that I did this. Even though I didn’t try as hard in high school, preferring to hang out with my friends, I still knew the value of hard work. As a teacher, I can compare my experiences to those of the students. Where I was given more work than most current schools, I understood the purpose of the extra practice. Those 50 + math problems daily gave me the practice that caused me to dig deep down to solve. I learned how my brain works. I had to find ways, because I also didn’t want to ask my teachers if I could solve the problems myself. As a teacher, I don’t often find students who will pursue excellence, though I always encourage them to raise the bar. It seems more common place that more and more are not seeing the need for additional work, but also if they don’t understand how to do the work, many rarely delve deeply into their own resources to discover. And it’s this discovery process, working hard, looking for ways to figure something out that leads kids to opportunities that might otherwise never happen. It also leads to a kind of individual determination that opens doors within companies. In some countries scaling high in academic excellence, the school days are longer, and in some, the students go to night school in preparation for their adult career choices. Perhaps that is a good way. Personally, I am happy with a work day, then time for homework and play. But the youth experiences set children up for their adult lives, and in this, I know, from personal experiences, the value of hard work and raising the bar. As a teacher, I also knew my responsibilities. I understood the curriculum, and through many years, knew various ways to teach them. I used the texts, I used other materials, I created lessons, and we often had mini-projects that supported their learning without them realizing it, but the information got in them: through their interests. We also used art as a motivator. Yes, the teacher is responsible for creating effective classroom environments, but the kids are responsible to learn the materials, and there is a benefit to homework that goes beyond mere learning and extra practice. Those in the classroom that took the initiative to do well, often were finished before their contemporaries, and often sought out extra work or extra credit. Ask for a 3 page story, they wrote 10. Ask for a project, they incorporated a variety of ideas. And they got out of the lessons what they put in. I can only imagine the opportunities awaiting them when they select a career or two. I understand how homework can appear tedious and overdone. Of course, part of this is determined by the classroom and teacher. But there is value that does not remove the kid’s childhood. Young people, in many teachers’ views, should learn to learn, work hard, have chores, but also have time for fun. But I also think the home life is key. In my experiences, for the most part, in homes where the parents are involved in their children’s learning, motivating them to academic excellence, but also sharing “family time,” doing things together, the children work hard but also find a sense of interdependence, self-dependence, and self-esteem that goes beyond just the work. Anyways, that’s one view. I understand others have varying experiences. What I found compelling about the Salon article is the point that, at the elementary level, fighting with parents about homework leads kids to dislike school rather than look forward to learning. I think that sometimes we do things in the spirit of “preparing kids for their future” to an extreme that totally forgets where they are. I don’t think it’s age appropriate for a 6 year old to do lots of homework. 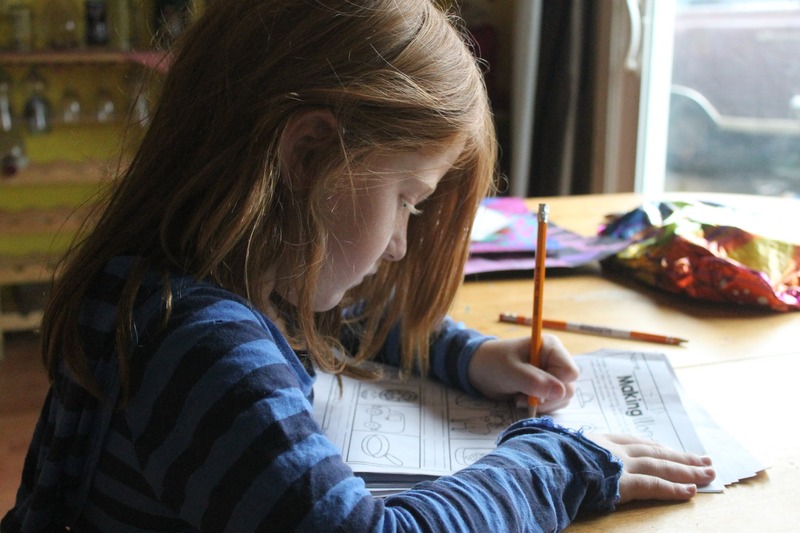 Maybe the home exercises are better than video games, but I think that introducing the extra work and problems in kindergarten and elementary school doesn’t really foster the work ethic you describe developing in middle school – it’s just bringing a level of stress to her learning environment that isn’t appropriate. At best, she might mentally check out and think homework is a waste of time, even when she is developmentally ready and it is appropriate. I appreciate reading your thoughts. My goal is to keep conversation going with my daughters’ teachers and make sure she’s learning what she needs to in school. I have the benefit of having a really bright child who’s doing well in school. I’m grateful for that and am grateful for the experience of other people to help me learn to navigate the educational world with my daughter. Again, and thank you for sharing, I addressed the quality of teachers in the classroom. Some have more experience and understanding, the lessons effective providing the students complete, and can use creativity to enhance the curriculum. Regarding “lots of homework,” I was one who did little prior to middle school, and was held back one year. So I did enough not to be held back again. To me, nothing was worse then having to take the same grade again. But I learned a lesson. The amount of homework will depend on each class and school. As a teacher, I know how much the students are completing in the class, and how much they should have completed before going home. And this I can see through their work, the time they actually spend working in class, and the discussions I have with the parents. I gather, if most of the kids have less than an hour of work each day, sometimes completing it at school, then the others should be able to have less homework provided the effort and support is there (And when some kids advance grades, having not learned the lessons from the prior year, this places great difficulties and road blocks to continued success.). Also, and this is just from one person’s experiences, school work should be challenging. And regarding “stress,” it depends upon how the work is viewed. If I told my dad that my teacher was giving us a lot of homework, his response would be: “Well, you better get started, then.” What this did was put the ball in my court. Then, I would be the one responsible to organize and set time aside for the work. Now, I understand 1rst, 2nd, and perhaps 3rd grade students should not be given too much homework, but the work was probably to my advantage and I learned and learned how to learn, and family can help organize the homework and study times.. Of course, I don’t know what is going on in every school, and I have heard the amount of homework differs between.